Metallic braces have been the traditional and a very effective way of straightening and aligning teeth. Many teenagers are still seen wearing the typical metallic lattice-work. Metallic braces are conspicuous and not liked by all. Also they need to be re-adjusted frequently the dental office. This means that you to visit your dentist or orthodontist many times in a month. Technology has now afforded an alternative to the braces in the form of clear plastic aligners started with the tradename ‘Invisalign’. Invisalign are available for adults as well as teenagers. Being made of almost invisible polyurethane plastic, they are hardly noticeable when worn. Braces, whether metallic or clear, are bonded or cemented to the teeth and can only be removed by an orthodontist. The Invisalign aligners are removable by the wearer whenever desired. For example, they can be removed for eating, teeth-brushing and flossing. However, you must check the temptation to remove them unnecessarily). Given below are some other advantages of the Invisalign. Improved Oral Hygiene — these aligners pose no special problems in brushing and flossing as do braces. A Discreet Look — the Invisalign aligners are not noticeable by others when worn. Braces on the other hand are conspicuous. More Dietary Choices — With metallic braces or wires you cannot do all biting and eating actions. For example, biting into an apple can disturb the braces. With Invisalign on you not need to take any such precautions. Comfort — The Invisalign aligners are thin shells, and the material does not irritate the gums. Metallic braces can. 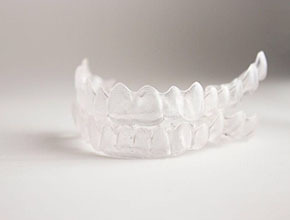 Protection against teeth-grinding—Clear aligners can also function as thin night-guards that can protect your teeth from excessive wear due to teeth grinding and clenching. Invisalign clear aligner technology has continuously improved over past years. It can correct many occlusion defects that were once considered too complicated for this form of treatment. However, there may still be situations where braces would be more suitable. Invisalign clear aligners work on the same principle as traditional braces do: apply carefully controlled forces to the teeth to move them into a more suitable position. However, the aligners are made of clear, flexible plastic instead of metal. State of the art hardware and software is used to make a 3-D model of your teeth and jaws. Special software can show it on the screen. The dentist then decides the best positions into which your teeth can be moved ultimately. The dentist can even show you on the screen what that final condition will be. Software then then determines a number of intermediate positions for your teeth through which they will be gradually made to move. A set of numbered tray aligners (one for the upper jaw and one for the lower jaw) are designed by the computer and manufactured using CAD / CAM facility. These sets are handed over to the customer with instructions on how to use. The first pair of aligners, when worn for two weeks, (twenty hours each day) will force-move the teeth gradually into the first intermediate position. Then the second pair of aligners will be worn for a similar period and move the teeth another step in the correct direction. Depending on the case, between 18 and 36 pairs of aligners are used to make a complete correction. The Invisalign Company has made improvements to its original design to make it suitable for teenagers as well. Teenagers have some teeth that have yet to erupt. Invisalgn for teenagers has special ‘eruption’ tabs which hold space free for teeth which are going to erupt or grow. Further, compliance indicators are built into the aligner material, which fade gradually with use. From the state of these markers parents and the dentist can tell how many hours the user has been wearing the aligners. The Invisalign are designed to be removable. While this can create a compliance problem (20 hours a day), it makes brushing and flossing easy. You must do this after every meal and snack, clean the aligner trays and put them on again. In this way, no food particles will remain trapped inside. The aligners will give you a much better smile than before, but to avoid your teeth drifting back towards previous positions you must keep on wearing ‘retainers’ as per advice of your dentist. Your aligner has been designed to be worn 22 hours a day, permitting you to easily remove it for meals or special social occasions. However, even while you are wearing it, it is virtually unnoticeable — that is one of its important advantages over the metal braces! And there are many other advantages which are not so obvious. For example, one of the benefits of aligners over the traditional braces is that alignerscan be easily removed (and reapplied). This allows you to clean your teeth just as usual-brushing and flossing your teeth the way you used to do previously. With metal braces on such cleaning is not possible. Metal braces also irritate some people in the cheeks and gums. Wire braces often force the wearer to rush to the dentist to immediately cut or adjust a protruding wire or to reattach a broken bracket. On the other hand, the plastic used in the aligners does not normally cause any such problems. With aligners on you do not have to watch what to eat and what to avoid as you do with wire braces. You are free. Aligners for adults have now been available for over a decade, but till recent times they were not normally recommended for teens. There were two main reasons: Firstly, teenagers werenot expected to keep them on for the desired 22 hours a day. Secondly, teenagers have some permanent teeth still erupting. That was feared to interfere with the precise movement of teeth. Fortunately has again come to our rescue. The teenager model of clear aligners incorporates “compliance indicators” located on the aligners themselves. These are colored dots that fade over time as the aligners are worn in the mouth, and indicate whether or not the wearer has followed the plan. To kill the second problem, ‘teenager” aligners are made with “eruption tabs” built in. These are designed to hold space for those teeth which have not yet fully erupted. It is for these reasons that more people than ever —adults as well asteenagers — are going forclear aligners. Are you one of them?